"The enemies are only 50 yards from us. We are heavily outnumbered. We are under devastating fire. I shall not withdraw an inch but will fight to our last man and our last round." Such were the words of Major Somnath Sharma before he sacrificed his life for the country in the 1947 Indo-Pak war. He was the first ever recipient of the Param Vir Chakra. In this article, we will have a brief look on the valor and courage of this brave army officer. He was born on 31 January 1923 at Dadh, Kangra, then in the Punjab Province of British India which is now in the state of Himachal Pradesh. Love for the nation came natural to him as he was raised in a family of military officers. His brothers were Lieutenant General Surindar Nath Sharma (retired as engineer-in-chief) and General Vishwa Nath Sharma (Chief of the Army Staff, 1988–1990). His sister was Major Kamla Tewari (medical doctor). His uncle Captain KD Vasudeva was martyred in the World War II while fighting in the Malayan campaign. He is an alumni of the Rashtriya Indian Military College, Dehradun. At that time it was called the Prince of Wales Royal Military College. He received his officer training at the Royal Military College of Sandhurst, England. His grandfather used to teach him the teachings of Bhagvat Gita and he was greatly influenced by the characters of Arjuna and Krishna. He went on to become the first recipient of the Param Vir Chakra. 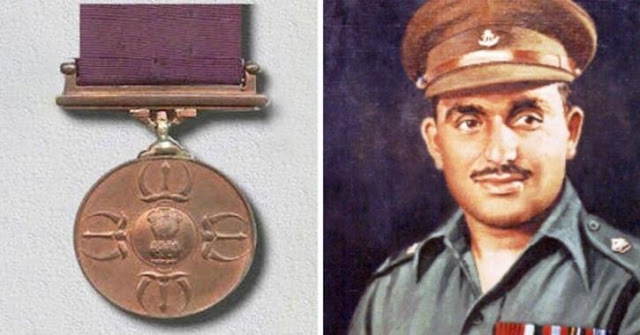 Coincidently, the Param Vir Chakra was designed by his brother's mother in law Mrs Savitri Khanolkar, an artist who also designed Ashok Chakra, Maha Vir Chakra, Kirti Chakra, Vir Chakra and Shaurya Chakra. On 22 February 1942, after completing his training from the Royal Military College, he was commissioned into the 8th Battalion, 19th Hyderabad Regiment, of the British Indian Army. After independence it became the Indian Army's 4th Battalion, Kumaon Regiment. He fought in the World War II against the Japanese in Burma during the Arakan Campaign. At that time he served under the command of Colonel K. S. Thimmayya, who later became the Chief of the Army Staff (1957 to 1961). In 1947, he participated in the Indo-Pak war. He was martyred on 3 November 1947 (aged 24) while fighting the Battle of Badgam where his team was heavily outnumbered by a ratio of 7 to 1. He posthumously received the Param Vir Chakra for his heroics in the battle. On 21 June 1950, the Param Vir Chakra was officially gazetted. On 22 October 1947, some Pakistani troops invaded Kashmir valley. In response, Indian troops were deployed in that area. Major Somnath Sharma was leading the D Company of 4th Kumaon. His team was airlifted to Srinagar on 31 October 1947. During this time, his left hand was in a plaster cast as a result of injuries sustained previously on the hockey field, but he insisted on being with his company in combat and was given permission to go. On 3 November, a batch of three companies was deployed to the Badgam area on patrol duties. Their objective was to check the infiltrators moving toward Srinagar from the north. As there was no enemy movement, two of the three deployed companies returned to Srinagar at 2:00 pm. However, Sharma's D Company, was ordered to stay in position until 3:00 pm. At 2:35 pm, Sharma's company was fired upon from the local resident houses in Badgam but counter-fire was not ordered to avoid injuring or killing innocent civilians. His company was suddenly surrounded from three sides by over 700 militants. He knew the importance of holding onto his position as both the city of Srinagar and the airport would be vulnerable if lost. Under heavy fire and heavily outnumbered, he urged his company to fight bravely. Heavy casualties were adversely affecting the company's firing power. So he took upon himself the task of distributing ammunition to his men, operating light machine guns. He often exposed himself to the enemy fire as he ran from one post to the other to distribute ammunition. While busy fighting, a mortar shell exploded on a pile of ammunition near him and he was severely injured. Before he lost his life, he managed to transmit a message to his brigade's headquarters which read: "The enemies are only 50 yards from us. We are heavily outnumbered. We are under devastating fire. I shall not withdraw an inch but will fight to our last man and our last round." His company's efforts bought time for Indian forces to fly into Srinagar airfield and block all routes of ingress to Srinagar itself. Major Sharma's body was recovered 3 days later. Though it was disfigured beyond recognition, his body was identified by means of the leather holster of his pistol and a few pages of Bhagavad Gita in his chest pocket. Along with him, 1 JCO and 20 NCOs of his company were also killed in this battle. His company managed to kill more than 200 militants in the battle.